"Gray Day on the River"
In Gray Day on the River what is presented to the viewer is so evanescent as to be almost illusory. The surface of the water (fully half the painting) is not visible, but only to be inferred from the presence of transitory shadow, light and reflection. Much of the remainder of the painting’s surface represents the shimmering greenery of what grows randomly along the river’s bank. Only the certain lines of the boat give us enough reassurance to trust the identities of the two small figures. We know their story is a peaceful one. Everything tells us that. Still, there is energy here; an energy barely contained. Frieseke’s early works, before Giverny, are disciplined, not only towards accuracy, but toward a strict limitation in permitted color harmonies. The model, the costume (if any), and any associated objects (hatbox, doorway, necklace, dressing table, lamp), are selected with an intent determined by design. And the design in turn is determined by a stern control that is frequently belied by the tenderness of an image’s effect. 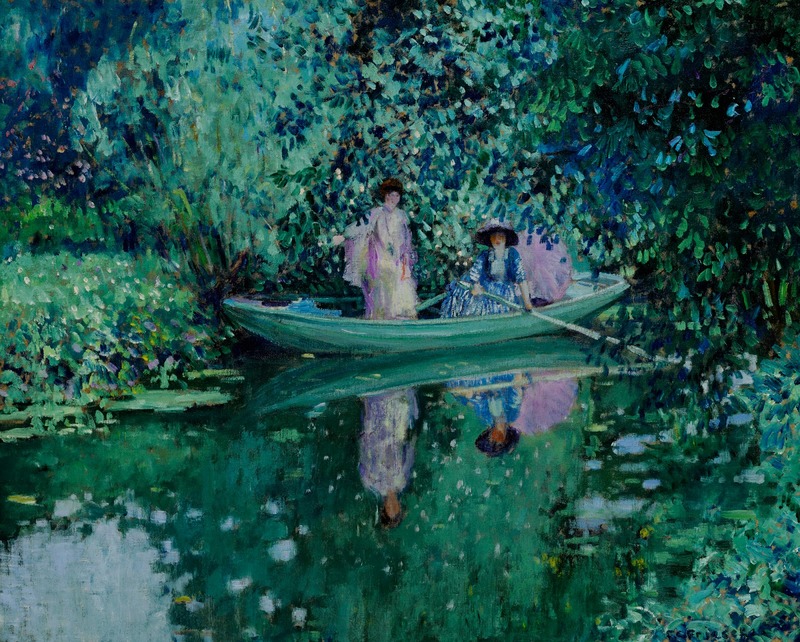 For Frieseke, the move toward plein air painting necessitated his abandoning much that he had relied on when applying structure toward his vision. In Gray Day on the River, perspective does not apply. Instead, the painter is confronted by an anarchy of nature whose organizing principles have little to do with what makes a picture. In both this painting and in its sister, Before the Bath, the foreground is simply the undetermined, plane of water on which the boat rests: a plane that takes light, shadow, and reflection without confessing either its depth or its extent.